Like most employees, you probably work long and hard hours at your job. You deserve to take a break every once in a while. Whether it is a quick coffee break or a full lunch hour, the time off can help re-energize you and make it possible for you to give your best efforts throughout the day. But are you legally entitled to take a meal or rest break at work? The answer in New Jersey is different from the answer in New York. But are you legally entitled to take a break at work? The answer in New Jersey is different from the answer in New York. While employers typically provide lunch and meal breaks in New Jersey, there is no legal requirement for most employers to provide any breaks. Your right to take time off might be set by a formal policy in the company’s employee handbook, an informal policy or even an unwritten practice. These policies are rarely legally enforceable. However, if you do have an enforceable offer letter or employment contract that spells out how much time you can take off for meals or other breaks, there is a good chance that agreement is legally enforceable. Factory workers are entitled to at least 60 minutes for lunch. Most other employees who work at least 6 hours per day are entitled to at least a 30-minute meal break. Employees who begin working before 11:00 am and continue working until at least 7 pm are entitled to an additional 20 minute meal break between 5 and 7 pm, for a minimum of at least 50 minutes per day. Employees who work more than 6 hours starting between 1 pm and 6 am are entitled to at least a 45 minute meal break during the middle of their workday, for a minimum of at least an hour-and-a-half per day. These are minimums, meaning employer policy or individual employment agreements can provide more generous breaks. However, employers are not necessarily required to pay their employees during these required meal breaks. Employers must pay non-exempt employees, meaning workers who are legally entitled to receive overtime pay and minimum wage, during any authorized short breaks during the work day. Generally, these short breaks are between 5 and 20 minutes long. In contrast, employers are not required to pay employees during their lunch or meal breaks. In contrast to rest breaks, a meal break typically is at least 30 minutes long. Since employers and not legally required to pay employees during lunch breaks, companies that voluntarily agree to pay for this time are not obligated to pay time-and-a-half overtime premiums for this non-working time. However, since employers are required to pay non-exempt employees for all of their hours worked, if an employee works through his or her meal or rest break at work, then he or she is entitled to be paid for this time. 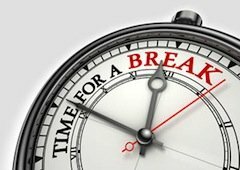 Nonetheless, many companies automatically deduct a full meal break from all of their employees, whether or not they actually took a break. By doing so, those companies are violating state and federal wage and hour laws. You may also be interested in reading our article, Employer Cannot Offset Unpaid Work with Voluntary Pay During Meals, from our New Jersey Employment Lawyer Blog.